Viewing the Greenland ice sheet from our luxury Arctic safari camp. Meeting grizzlies on the beach from our private small ship in the Alaskan wilderness. Watching the northern lights through a heated glass enclosure on the Canadian tundra. Gaping at polar bears just feet away on a nature expedition along Hudson Bay. These are among the extraordinary northern adventures that await the uncommon traveler. 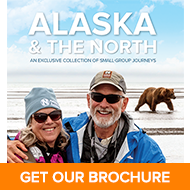 Complete the form below to request your Alaska & the North brochure or click here to learn more about these journeys on our website. Fields with an asterisk * are required fields and must be completed.